Cooking has become more than just a hobby or another chore that we have to get over with. More cooking videos are getting posted daily and innovative cooking methods are coming into play. Do you ever worry about using too much water or oil in your food? Then waterless cookware is the perfect remedy! It ensures that the food is cooked in a nearly waterless environment and without any extra grease. To achieve this, the food utilizes natural juices and oils present in the ingredients as opposed to using additives. Using waterless cookware is both effective and efficient in terms of energy and costs. 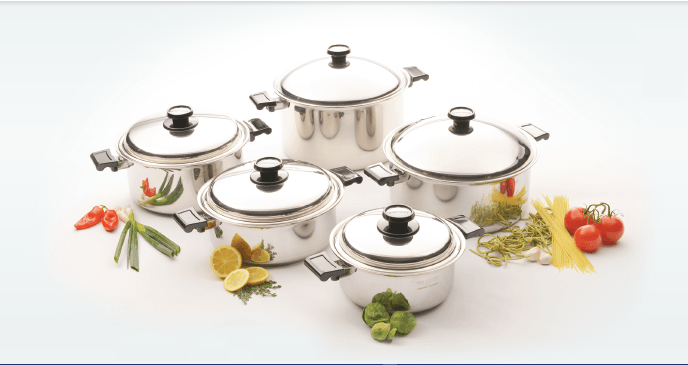 If the rise in lifestyle diseases has shocked you into healthy cooking, then you will definitely love waterless cookware. It is probably one of the best kitchen invention in a world that is more conscious about what they consume. The good news is that you don’t have to worry about using. Here is a comprehensive guide just for you! Once you have washed your ingredients in the kitchen sink, the first step is setting the required heat. Bear in mind that waterless cookware makes use of the moisture in the ingredients to create steam which then cooks the food. Too much heat might cause the food to burn while too little heat may result in undercooked food. This is also the part where you use the right size of cookware based on the food quantity. To get the perfect food, never set the heat to more than medium. If you are using a stove then low heat would be the best alternative. While vegetables just require you to add in a few tablespoons of water, meat and eggs require a preheated pan. This creates a sear that prevents them from sticking to the pan and ultimately burning. You have finally put all the ingredients in the pan and controlled the heat now what? As you start to cook, it is advisable to fist leave the steam valve open. Don’t close it until the steam begins to whistle or escape through it vigorously. Once it is closed, ensure you turn down the heat to low and then let the food cook. The secret to knowing whether the heat is just right is to check the pot’s lid. If the lid keeps spinning freely as the cooking continues then the food is cooking just fine. should you notice that the lid seems locked on to the pan, it is an indication that the heat is too low. A bouncing lid with too much water and steam escaping is a sign of high temperatures. the amount of water used in the cooking process is dependent on the type of food. For vegetables, you don’t have to add any water as you risk them becoming too mushy. Other foods might require a few tablespoons of water while dry foods like rice may need like an 1/8 cup. When cooking food on normal cookware, you have to keep checking how far along the food is. However, for waterless cookware, it is imperative that you keep the lid locked until the food is cooked. This means that you have to resist very urge you have to take a sneak peek into the pan. The lid on the waterless cookware forms an airtight seal that keeps the heat in and cooks the food. Other foodstuffs like turnips or potatoes can take anywhere between 20 and 25 minutes. Once you are sure that the food is fully cooked, you can then take the lid off. It is not uncommon for the lid to feel locked on to the pot when you take the pan off the heat. When that happens, don’t try to forcefully pull the lid off. Keep in mind that the only reason the lid seems stuck is due to the pressure change. The best thing to do is to open the steam valve and allow for vacuum release. Once the pressure has been released, opening the lid is pretty easy! If that does not work then the only thing to do is to reheat the pan. What makes waterless cookware stand out from regular pots? Here are some benefits! Energy efficient- waterless cookers are designed to coke food within the shortest time possible and the least amount of heat. Nutrient retention- waterless cooking ensures retention of over 90% of the food’s nutrients. Tastier and visually appealing foods- much of the foods looks and flavor gets diluted by water. With waterless cooking, little or no water is used which leaves all the flavors and color intact. Other benefits include a reduction in cooking time, more safety and easy cleaning and maintenance. They say cooking is an art but it is equipment like waterless cookware that make it a while lot easier. It is the perfect alternative for anyone embracing a healthy lifestyle. Unlike other cooking methods, waterless cooking retains all the flavors making the food tastier. It is also safer as the most pans are made of aluminum encased in various layers of stainless steel. The steel ensures that harmful materials don’t contaminate the food. It is also a good heat retainer so the food can still be cooked while the heat is off. The best part is that using waterless cookware is not so hard. It is all about controlling the heat, allowing the food to cook and then letting out the pressure.